With our CDN REST API you can automatize certain actions, such as purging CDN content, directly from your application. To create a CDN API please follow these steps. Go to Services → APIs. Fill in your desired Label as in the picture below. 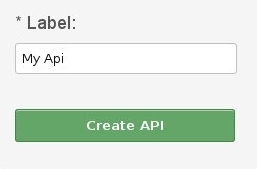 Click the Create API button and that's all. When you create a CDN API then you obtain its Username and Password to access it. Please note that you can view these credentials at the Services/APIs page. For easy access to your CDN API from your application please take a look at our CDN API client.